To get a deal over the line you MUST convince the prospect that there is a “Cost of No Decision”, that the risk and costs associated with not buying your solution (or one of your competitors in fact) are too great to ignore. In all cases buying a ‘new solution’ for a business means they are about to enter into a period of change. The prospect must decide to do something new because the ‘old’ way isn’t working for them and this means they need to have a clear value case that offsets the cost of effort to communicate and implement this ‘new’ way of working. However, this is exactly the reason why decisions get delayed or even postponed. We found in our research recently that one in four b2b deals fail to happen at all, with slippage and then ‘lost to no-decision’ a major issue for many sales leaders. This is because the psychology of people in most of these situations means they are looking to avoid any change if they can help it. They’re happy with steady state, happy with what they have and not looking to enter into the perceived stress and risk associated with something new. That is unless they can feel the pressure associated with either their under-performance or those associated with competitive threats in their marketplace. Sales people need to help the client see this risk of loss and under performance or they risk deals slipping endlessly. If your client is can see the impact of delay they will have urgency to act. Consider whether to qualify this deal out if they can’t see this or look for new contacts in the customer organisation who may be more able to understand these things. They are likely to be the people able to drive forward the change agenda. So how might you have this discussion? We have outlined a few questions you can use to do this below. • If you continued with your current approach to [Thing], what would this mean to your business? • Which parts of your business would be affected if [thing] is not improved? • How much does the issues associated with [thing] affect each area? • How are you trying to improve performance in [thing] right now? • What are the major barriers standing in the way of change of a change to [thing]? • What will help to ensure that you can sustain change in your business? 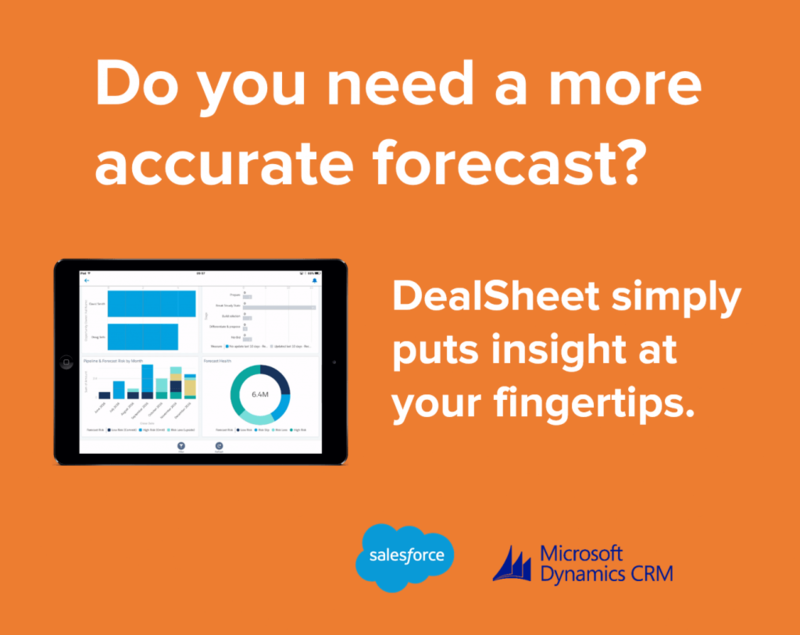 By way of an example, let’s look at DealSheet, a very easy to deploy sales methodology for Salesforce and Microsoft Dynamics CRM. It helps to improve opportunity management. The deployment is simple to achieve with a 15 minute installation process but we understand there is additional effort required to embed the change of approach in the sales team. If you continued with your current approach to [Opportunity Management], what would this mean to your business? That they are losing more business and spending more money doing so. This negative spiral is a huge risk for many companies investing significant sums in under performing sales teams to pursue a growth agenda. Which parts of your business would be affected if [Opportunity Management] is not improved? All parts of the company typically, sales success is the fuel that feeds the company although the sales and marketing teams are hit most profoundly in terms of sales productivity, morale and results. How much does the issues associated with [Opportunity Management] affect each area? This varies considerably but on average b2b companies win only 41% of their opportunities. Therefore wasting nearly two thirds of their time chasing deals they don’t win. We help to quantify the potential improvement using our Business case tool. How are you trying to improve performance in [Opportunity Management] right now? A mix of offline systems, spreadsheets and nothing. What will help to ensure that you can sustain change in your business? Make it easy, customisable for each company approach to opportunity management. Change is not too complex and can have significant impact. We have had to gear up to help our customers through this journey but we still believe our offer is compelling when compared to other options out there.